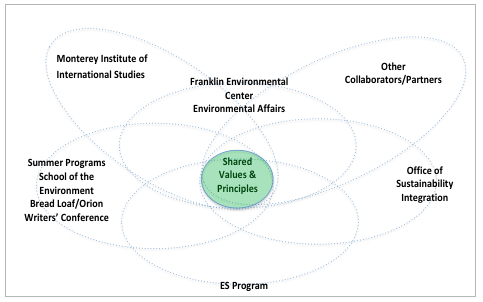 As the fiftieth year of Middlebury College’s Environmental Studies program approaches (2015) we are initiating a dialogue to shape a common vision and goals to guide collaborative efforts among the various entities involved in education for the environment and sustainability at Middlebury and from other perspectives beyond our campus. This blog serves as an archive and source of information where materials pertinent to the process can be found and comments and ideas shared by those involved. Over an 18 month period or so we are engaging as many people as possible with experience and expertise in exploring: a) what is/will be needed to achieve a more sustainable future, and b) how liberal arts programs in environmental studies and sustainability can more effectively serve those needs through curricula, operations, research and engagement with our broader communities. We’ve taken initial steps to prepare for this conversation through consultation with the Environmental Studies Steering Committee, a half day session with a facilitator to define the process and its constraints, formation of a structure and a core team to move things along and assure active communication with all who are interested. The core management team consists of the directors of each of the four program areas and the previous and future ES directors. We have also devoted the near entirety of our annual retreat to the topic. The draft statement of shared purpose developed at the retreat follows. · Contribute to and engage relevant communities.